OXFORD, Miss. 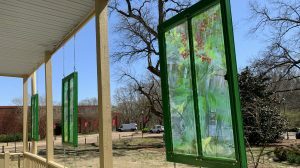 – Oxford-area artists Rebekah Flake, Valerie Guinn Polgar and Sarah Barch have created custom art installations on the historic Walton-Young House, next door to the University of Mississippi Museum. The purpose of this installation is to animate the house and display the art of local artists. Each piece is weather-resistant and has ties to the community. Flake and Polgar, working together, incorporated their skills in photography, animation and electronics to create four separate displays, installed on each of the three porches and in the front bay windows. “The Walton-Young House location, which sits at the intersection of town, nature and university, serves as a beacon or ‘lighthouse’ that is a point of connection for the whole community,” Flake said. Flake and Polgar’s pieces are themed to represent what can be seen standing on each porch and looking out of the window frames, each with a representative color: red, green or blue. The north porch, on the front of the house, faces town and is styled in blue with a picture of the Oxford water tower. The west porch, facing the Brandt Memory House, reflects the university in red. The south porch, on the rear of the house, mirrors nature, specifically the Bailey Woods Trail, in green. At night, the front bay windows light up with projections of the same themes. Barch created a Victorian crazy quilt, “Something to Keep Warm,” that celebrates and pays homage to women who stitched beauty into their homes while also keeping their loved ones warm. 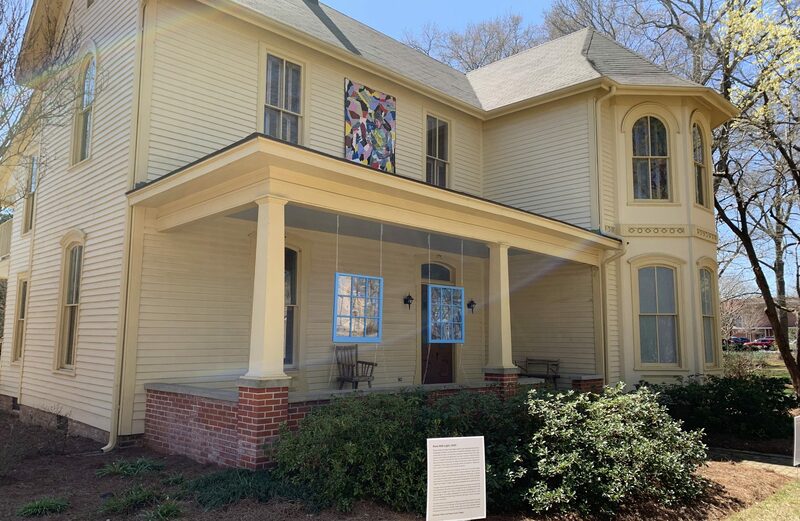 “In putting this quilt on the outside of the Victorian-era Walton-Young House, I take what would normally be hidden inside such a house and place it outdoors, for everyone to see,” Barch said. The quilt follows tradition and does not have a set pattern, but the pieces are carefully sewn together by the woman who created it and then embellished with her own style of creativity. “I hope that doing so makes visible not only the quilt as art, but also woman, and the creative energy that she often uses to – in many different ways – keep us all warm,” she said. Admission to the UM Museum is free. The galleries are open 10 a.m.-6 p.m. Tuesdays through Saturdays. The UM Museum is at the intersection of Fift​h​ Street and University Avenue. For more information, call 662-915-7073 or visit http://museum.olemiss.edu/.